As a founding director of Activate Architecture and proponent of high-performance architecture, Edward Brooks took the opportunity to apply twenty years of award-winning design experience to his family’s new abode on a very special view site in Upper Houghton. A subdivision of a property previously owned by Luis Ferreira da Silva, on an extremely narrow site of 52mx12m, ‘Wild View’ has been carefully designed to accommodate a family of four, ensure privacy for neighbours, and guarantee good resale value. The footprint of the new house on the southern side of the property is the site of an old office and garage; and a studio, built by Ferreira da Silva on the northern boundary of the site, was occupied by the Brooks family for two years during the construction of their new home. Brooks explains that this arrangement of two completely separate buildings has created three external spaces – a courtyard between the street and main house; a central garden and natural swimming pool area between the house and studio; and a deck and succulent garden with breathtaking views to the north of the studio. 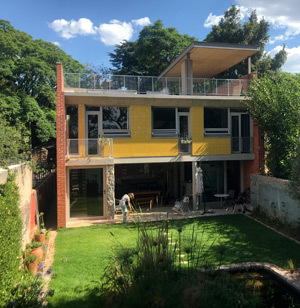 These spaces, together with a roof garden and pergola set in the canopy of a jacaranda tree on the second floor of the new building, give the family and their guests completely different experiences depending on the time of day and the season. The volumes of the building are formed by two boxes on top of each other. The ground floor accommodates open plan kitchen, dining and living spaces; while the first floor has three bedrooms facing north to optimise light and views, with bathrooms and services to the south. Generous overhangs shade the rooms from full sun in summer, while double glazing on the south façade traps heat in winter. The thoughtfully detailed staircase can be used as a ventilation shaft in warm weather, by opening the glass door at its foot and the large window at its head. A double-sided wood-burning fireplace keeps the interiors comfortable in winter, and a recently installed solar water heating system has halved the Brooks’ electricity bill. The house has also been wired to take a photovoltaic system, and all lighting is LED. The natural, chlorine-free swimming pool works on a very low-energy pump, and will eventually be solar powered. Materials were chosen to be low maintenance. The attractive red face brick, used for the east and west cavity fin walls, and natural stonework both pick up on the language of Houghton’s heritage buildings; and the interior palette is neutral, allowing for interpretation and re-interpretation. 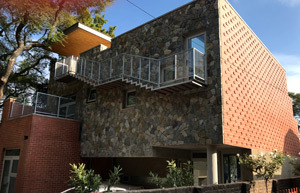 The textures on the façades reflect the fact that the façades do different jobs and therefore have different characters – with smaller openings hinting at the need for privacy on the south, street-facing façade; patterned, but solid, face brick fins on the east and west boundaries; and a more playful façade with coloured tiles, large windows and sliding doors on the north. Wild View demonstrates how, with meticulous planning and thoughtful detailing, contemporary, high performance architecture can assimilate effectively into a strongly heritage context.